I approached this disc with considerable trepidation. Why? Because this version of the Four Last Songs was a discovery from over forty years ago, during that wonderful period from the mid-teens to the mid-twenties when life truly was full of wonder. When for me, music previously unknown, once encountered, had the impact that enabled repeated listening to be a positive joy with the pleasure increasing upon each hearing. Those days, alas, are long gone, and many of those early treasures have since become, if not tarnished, less lustrous than the initial impression had conveyed. Thankfully, some still remain undiminished, the Four Last Songs among them. However, I have come to recognise that with the passage of time, unlike many music lovers who have that gift of hearing only the music regardless of any extraneous accompaniments, I am not so blessed. LPs for me became a frustration rather than a pleasure as I found myself almost dreading quiet passages with the inevitable intrusion of spits and pops. Even live performances could be destroyed by the fidgety rustling of a programme, or a lethally interjected cough. I am therefore an unashamed digital man for whom the advent of CD, despite its attendant ills, particularly in the early days, allowed pleasure to be derived from recorded music once more. Hence my trepidation. Was a golden memory from forty years ago to be revealed as yet another of youth's delusions. Happily the answer is no. This reissue is, of course, in unadorned mono, but Decca have in my opinion, effected a remarkable resurrection, and Della Casa's voice in particular shines through revealing beyond question the very special quality which created so powerful an impression so long ago. Of course the recording sounds dated; how could it not, but the overall experience is, I believe, likely to be quite acceptable even to younger ears uninfluenced by the tolerance of nostalgia. Compared with more recent versions, Gundula Janowitz in analog sound and Felicity Lott in Chandos's digital, limitations are clearly revealed, but while the Della Casa may not be the only version which one would want to have on one's shelf, it would now merit regular airings, even for one who is perhaps unduly concerned by sound quality. The Capriccio excerpt is similarly successful. Well done Decca. Equipment used: Proceed CD transport. Chord DSC 1100 DAC. SPA3200 Pre-amp. SPM 1200B Power amp. B&W Nautilus 802 Speakers. Lisa della Casa born near Bern in 1919. In her heyday she sang with the most radiant tone and beautiful musicianly phrasing. Initially, she concentrated on lyric soprano roles (Gilda, Pamina, Sophie). Then, gradually, she extended her repertoire to include spinto roles but she was always careful never to strain the voice. Although it was extremely powerful (as evinced in her high notes in the Arabella excerpts on this album). The two composers who best suited her voice and temperament were Mozart and Richard Strauss. Furthermore, and it will come as a surprise to some, Böhm eschews the broad tempi and quite arbitrary ritardandos that became the fashion, that instilled the work with exaggerated solemnity and pathos because it was thought that that was the appropriate manner for a great 'swan song'. Instead, Lisa della Casa imbues these glorious songs with a fresh youthful charm devoid of cloying sentimentality. Here the mood is conciliatory, bright and spiritualised. Böhm accompanies her gloriously; that sublime violin solo in 'Beim Schlafengehen' has rarely sounded so haunting and those pp horn figures that close each movement are beautifully refined and distanced perfectly. The sinuous lines of 'September', with the voice floating angelically above, are also contoured and shaded to perfection. The excerpts from Arabella are heart-warming too. The role gives della Casa the opportunity to display a range of emotions. First we hear the aria leading to the duet with her sister Zdenka (ravishingly sung by Hilde Gueden) in which Arabella sings wistfully 'he's not the right man for me' but that if there is a right man for her there will be no doubt about it. Della Casa and Gueden are quite exquisite. Exquisite too is the haunting and passionate climax of the following duet for Arabella and Mandryka (an oaken Paul Schoeffler) when they acknowledge their love. The third excerpt is the closing scene in which, after some tribulation Mandryka (this time a slightly lighter voiced, Alfred Poell) and Arabella's relationship is cemented. 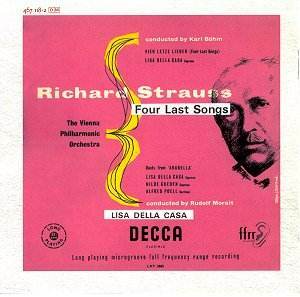 Another enchanting moment this, with Strauss at his most sensuously romantic. 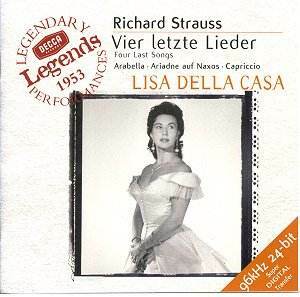 When Lisa della Casa appeared as Ariadne in 1949 some critics expressed reservation about such a young singer daring to take on a role that could be as demanding as any in the Wagnerian soprano repertoire. But she adapted to the role and freed the character of the heroics that had generally burdened it. As can be heard here she sings 'Es gibt ein Reich' (And it has a name: the realm of death), like some young innocent girl surrendering herself with an untroubled spirituality to the dark god Hermes. It is interesting to hear the lowest register of the voice early on as she utters the dread name of the god. The concluding excerpt is from Richard Strauss's last opera Capriccio. Della Casa shows off her distinguished aristocratic voice as the Countess who is wooed by a poet and a composer. She sings the composition that is their joint collaboration. She must choose between words or music. She finally decides that both words are equally important - but as for the men; well that is left open as she coquettishly swishes her fan at her reflection in her mirror.